So, if you've noticed my updated tour schedule, I'll be at Children's Book World in Haverford, PA this Saturday. And then we are speeding off home right after that Saturday morning event because I have my the FCB's bookclub meeting on Sunday afternoon (I think there is one space left so claim it now if you want to come!). Hopefully, Rain Dragon won't get too cranky! But with all that rushing and traveling, I've decided to extend the deadline for my Starry River of the Sky Giveaway! 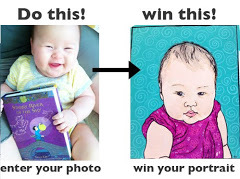 You now have until midnight on December 5th to share your photo, and I will announce the winners--including the grand prize winner of the portrait painting on--December 6th! So get your entries in! !